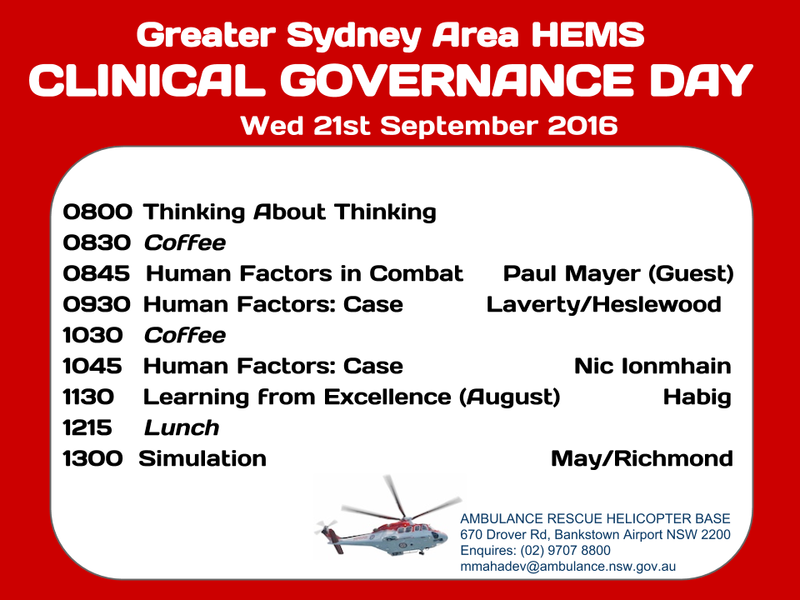 Join us next Wednesday for a human-factors-focused clinical governance day at the Bankstown helicopter base. We are particularly excited to welcome Paul Mayer, a Naval medic who returned from operational duties in Afghanistan earlier this year. He’s going to talk about his experiences of human factors in combat along with his reflections on how the Sydney HEMS induction course (which he attended in 2014) helped prepare him for delivering care on the frontline. We’ll be undertaking an interactive exploration of some recent challenging cases from the service and taking time to learn from excellence in our HEMS practice (formally known as ‘Awesome and Amazing’). We’re hoping to take a break for a BBQ lunch in the hangar before rounding off the day by putting our thoughts into action with some simulation. As always, all NSW Health staff are welcome to attend, a sign in is required. See here for directions: https://sydneyhems.com/contact. This entry was posted in Cases, Presentations, simulation and tagged CGD, education, pre-hospital. Bookmark the permalink.